July events. And fish paste. Come to Books Inc. in Berkeley tomorrow for a Bastille Day event with me and mystery writer Cara Black! There will be wine and cheese and much frenchiness. Cara is trying to talk me into singing the Marseillaise. Seriously, you can’t possibly miss me embarrassing myself to this degree. Also cool: my story “Commuting” is going to be performed at Sacramento’s Stories on Stage on the 29th. I am very stoked and somewhat terrified about this (imagine some other voice performing your voice!). Do take a look at the lovely interview Sue Staats did of me for the Stories on Stage blog. If you come and someone in the audience bursts into flames from brain overload, that would probably be me. I had the most fabulous dream: I was playing a Disneyfied under-the-sea videogame in which I had to go up all the levels of the ocean in order to reach the surface and ascend to meet Poseidon on Olympus. I did it as a merman and everything was cool. Then I did it as Ariel, the little mermaid from the Disney movie, and on the way up through the sky to meet my maker, I was sucked into the turbine of a jet engine. It. Was. Awesome. Either my unconscious was making some kind of commentary about inequality of the sexes, or it just wanted to grind some fish paste. 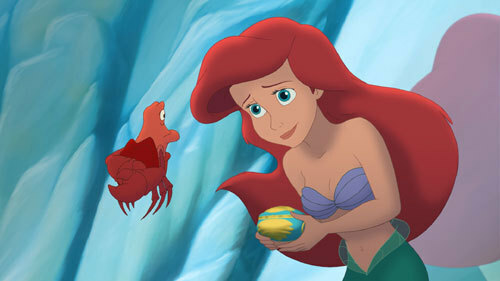 Girl, take off those seashells and give that lobster something to sing about. This entry was posted in Uncategorized and tagged Bastille Day, Books Inc., public speaking, Stories on Stage. Bookmark the permalink. Good to hear from you, Elena! Oh, Ariel’s big in our house. Nice work, there. But so is cheese and wine and all that goes with it–I wish I was closer so I could partake at Book, Inc tomorrow. And a huge congrats on the performance of your story. Any chance for some video footage? Thank you! I think footage is probably happening, yes. Eeeeeeeee!